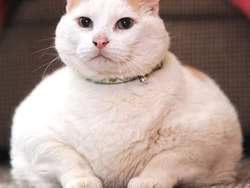 By now someone in your office or family or local paper has informed you about Powder aka “Princess Chunk“, the 44 pound cat found in New Jersey when his owner was unable to care for him. Not much is cuter than something this round and furry on four legs, but I know what's even funnier: all the clever names people have written in for the tubby kitty. Kirstie Alley Cat, Catty Arbuckle, Beefer Sutherland, Fatt Damon, Minnesota Fats, Raymond Purr, Fats Sajak are among my favorites – I am apparently helpless before a fat celebrity name pun.